With the art of Hercules Segers, Dutch landscape painting turned to new directions. Trained in the circle of the Amsterdam Mannerist artist Gillis van Coninxloo, Segers’ early work reveals Flemish influence. His paintings and the important position that he held as a graphic artist, in which he experimented with inks and supports, make him one of the most notable Dutch landscape artists of the early 17th century. His surviving oeuvre is small and only eleven oil paintings are known. Furthermore, they are undated, which has made it difficult to establish their chronology. We know from literary sources, however, that his output was originally much larger and that he was appreciated by an elite circle that included Rembrandt who owned eight of his oils in 1656. In the 1630s Rembrandt was interested in Segers’ fantastical panoramic views and in his distinctive use of dark tones and the influence of Segers is evident in Rembrandt’s work during this period. In the present work with its high viewpoint, Segers depicts a broad area of landscape framed by low hills covered with trees on the left in the foreground and on the right in the middle distance. The low horizon line allowed him to depict a large area of ground in which land and water are combined and which terminates with the distant seashore, creating a sense of depth. The characteristic use of brown tones in the dry shrubs in the foreground lead into a zone that combines greens and yellows to create the vegetation in the distance, dotted with various red notes in the façades of the buildings. This spatial organisation is assisted by the light, organized into broad strips of ground in shadow alternating with lighter ones, a procedure that would subsequently find its maximum expression in the work of landscape painters such as Philips Koninck and Jacob van Ruisdael. 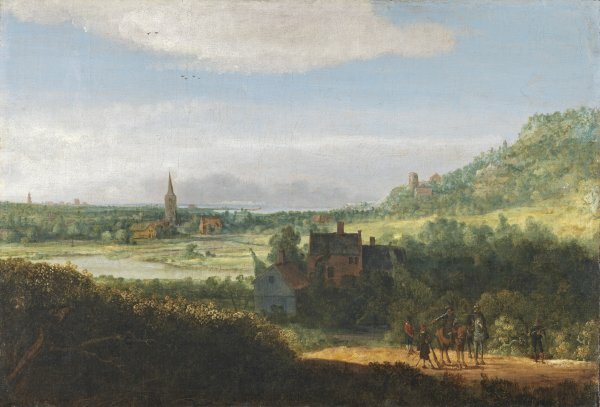 Landscape with armed Men has been compared with regard to its date with two works by Segers in the Boijmans-Van Beuningen Museum in Rotterdam: Landscape with a Lakeand Valley with a River and Houses. Both works, which have a similar composition to this one, have been dated to the 1620s. The three date from slightly after the famous Mountain Landscape in the Uffizi, Florence, which belonged to Rembrandt and which that artist re-touched. This canvas entered the Thyssen-Bornemisza collection from the UK art market in 1980. It had previously belonged to the Historical Society Museum and Art Gallery of New York where it is recorded in 1867. It was auctioned in New York by Parke-Bernet in 1972. While with the Historical Society it was catalogued as by Salomon van Ruysdael but was re-attributed to Segers by Haverkamp-Begemann. In 1987 the canvas was studied using infra-red reflectography. This revealed areas that were not original, such as the high tower almost in the centre, as well as extensive re-touching in the branches and leaves in the foreground. These modifications also affected the figure with the musket, which reappeared after the picture surface was cleaned during the time the canvas was with Edward Speelman.